From Lake Shore Drive, exit at 18th Street. Follow Museum Campus Drive around Soldier Field. Signs will indicate visitor parking. Shedd is just north of the parking garage and the Field Museum. The Soldier Field north garage entrance is open from 5 a.m. to 5 p.m. daily. The small parking lot east of the Field Museum is open from 8:30 a.m. to 3:30 p.m. Drivers can always exit after closing hours. Everyday parking rates for the Soldier Field north garage are $19 for the first four hours, $22 for four to 12 hours and $41 for 12 to 24 hours. The east museum lot is a flat $22. The Adler lot, at the east end of Solidarity Drive, has three rates for cars: $11 before 9:30 a.m.; $19 after 9:30; and a $13 night rate after 4 p.m. The new overnight rate for the north garage, east lot and Adler lot is $22. Admission is occasionally on a cash-only basis. Parking rates typically are higher during sporting events, and garage access may be restricted to game ticketholders. Rates and hours for all lots and garages are subject to change without notice. All Museum Campus parking is owned by the Chicago Park District and managed by Standard Parking. For the most current parking information, visit www.soldierfieldparking.com/. On most weekends, valet service is available to aquarium guests for $26. Take advantage of this service at the guest drop-off area on the south side of the aquarium, off Solidarity Drive. Subject to limited availability. Explore creatures from the various waters of the world, including rivers, reefs, small and Great Lakes and well as the ocean. Exhibits include the Caribbean Reef, Amazon's rising's flooded forest and the Pacific Northwest coast. You can also spend time in the Polar Play Zone or see on the aquatic shows. There are a total of 32, 500 amazing animals at the aquarium, including otters, octopus, whales, penguins, jellies, turtles and dolphins. There are various admission prices depending on what you want to see and what you have time to see, check their website for package options and further details. Special hours apply for some holidays and special events. Visit website for more details. Learn what you can see in a day at the Shedd Aquarium. 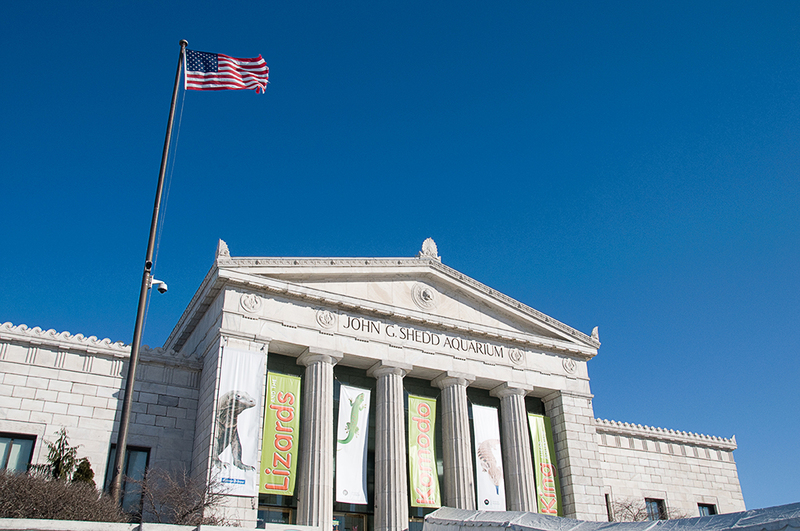 If traveling to Chicago, be sure to check out the Chicago CityPass that offers discounted admission to the following: Shedd Aquarium, Skydeck Chicago, The Field Museum, Museum of Science and Industry or 360 Chicago and the Alder Planetarium or Art Institute of Chicago.